Dr. Siddharth Shah: Yesterday, we started the ball rolling by talking about salt and hypertension and it took almost half of the session of encyclopedia on salt and hypertension, which we never imagined, but today I think we will start the ball rolling by taking a cue from Dr. Kaul who talked about ambulatory blood pressure monitoring, so we would like to have some comments from each one of you. There have been suggestions that blood pressure can be diagnosed only by ambulatory blood pressure monitoring, what is your take on this? Dr. Upendra Kaul: Well, I do not think that this is necessarily true, although you know, if it permits any person with hypertension, before you start the person on treatment, if it is possible to do an ambulatory BP monitoring at least one-third of the patients will not be started on the drugs and that is why NICE, they always go into the cost effectiveness before putting in a recommendation, they recommended every new person where you are going to start treatment, should have an ambulatory BP monitoring because they found that in the nutshell, at the end of it, bottom line, they save money for the country's health service because so many people who would be on long-term 1 or 2 drugs would not require. Having said that, it may not be, you know, easy for us at this stage to have it, so any person who has, as our guidelines say blood pressure more than 140/90, three readings, 2 visits, I think continues to be our, way of diagnosing hypertension. But in difficult patients, where a patient himself comes, when they come here, the blood pressure is this thing, at home, this is that thing and the patients you put on 2 drugs and he says it is controlled, you find it is not controlled, invariably found that very often you do not have to increase the drugs when you look at. Dr. Siddharth Shah: I think the Indian guidelines are said the same thing. Home blood preparation monitoring should be encouraged and ambulatory blood pressure will be the future for diagnosis of hypertension. Dr B R Bansode: I think in present scenario in India, the normal blood pressure apparatus can diagnose the hypertension, but we have carried out a survey from hypertension society in all over India, 5000 physicians with 50,000 patients were evaluated and what we found that vegetarian diet increases the blood pressure. The blood pressure is more in vegetarian, why, it was salt culprit. As yesterday Dr. Kasliwal has said, APC "achar, papad and chatni" is more with the vegetarian. Similarly, the white coat hypertension is easily diagnosed with the ambulatory BP monitoring and this is a subset of patient in present context in Indian scenario, is not every patient should be screened with the ambulatory BP monitoring, but white coat hypertension, as rightly said by Dr. Amaresan that patient who are having labile hypertension can be screened with the ambulatory BP monitoring. Dr. Nakul Sinha: Question: Some more information about bisoprolol. Basically, bisoprolol the best known indication is obviously congestive heart failure due to left ventricular systolic dysfunction and this has been tried out in CIBIS I and CIBIS II trials. It can be used for hypertension also, I mean, may be uncomplicated or where you would like to use a beta-blocker, but then perhaps more robust data is available with other beta-blockers, but the best known indication is congestive heart failure. It is quite like carvedilol in most of its effects and also has shown good results. Dr Muralidhar Rao: We do not have data regarding a direct comparative data between carvedilol and bisoprolol? Dr Nakul Sinha: No head-to-head comparison, I do not remember any. Dr Apurva Vasavda: If you are going to inculcate home BP monitoring into our practice, I think there are certain things, how will you educate the patient because we find lot of patients would measure their BP at home only when they are not feeling well, say headache, giddiness and at that time usually the blood pressure comes higher than what it is actually, how do we educate our patient if you are recommending. Dr. Nakul Sinha: See, even before that question what I just wanted to say that I frequently use it even when the patient is seemingly well controlled in hypertension. If there is a patient with some complications because #1 I want to be very sure that there are no episodes of hypertension or hypotension. Otherwise, that may lead to organ dysfunction. I mean suppose you are still having a dipping pattern and the systolic pressure is going very low down during the nighttime, then you may be increasing the organ dysfunction or many a times, I mean, as you very rightly said that patient will only measure it when they feel something abnormal, but what about when they are having hypertension without feeling anything, so ambulatory BP monitoring has the potential to pick these ups and downs and perhaps be more reassuring that you are having a reasonable control within that therapeutic range. Fine, you have to educate the patient that it is not only when you are feeling abnormal or you are having a headache that you should measure blood pressure, but if it is a home monitoring, you have to measure it regularly, perhaps at pre-set time intervals, which will depend on the time of the administering the medication or time of taking the tablets, that is also important thing. Dr Muralidhar Rao: Era of continuous monitoring. 1. Holter monitoring for instance. 3. Now we are going to have continuous blood pressure monitoring, nothing surprising. Question from Audience: We are using the very low-dose carvedilol in this part of the world as compared to European and American population. Is there any difference in the Asian group, requirement of carvedilol is very low as compared to the European and American. Dr. Nakul Sinha: I do not think there is any data comparing different populations, but basically as I said during one of my slides if you have coronary artery disease patient or post MI patient, then perhaps metoprolol succinate, the long-acting one, is the drug of choice because that has been shown to be more beneficial than carvedilol and in nonischemic cardiomyopathies where you have LV dysfunction, heart failure, etc., there I think carvedilol scores slightly better, but I mean, I believe it is class effect with some differences, no doubt, but the difference is not heaven and earth, but there is some difference. Question from Audience: Regarding ambulatory blood pressure monitoring, Dr. Kriplani had done a study in the chronic kidney disease and he showed that there is wide range of variation in 24 hours if the patient although on any antihypertensive control during the daytime, at home there is fluctuation in the blood pressure and not controlled and it is important to do the ambulatory blood pressure monitoring to know blood pressure is controlled or not as compared to the only single blood pressure monitoring? Dr Siddarth Shah: We will discuss that during lunchtime, because I do not think we are getting it. If it is a short question, it will be a welcome or if you can write down. Dr. Amaresan: Question: I think Dr. Goyal has asked using ACE and ARBs in CKDs patient what would be the cutoff point in reference to serum creatinine and blood urea. There is always some amount of hesitation for people using ACE and ARB in spite of the fact that they are pleiotropic drug. I have shown in my lecture that they are capable of so many things besides reducing blood pressure. You should not hesitate. There was a recent seminar on dialysis. Even in CKD stage V, you can use ACE and ARB and I gave the reason because they reduce the cardiac morbidity and mortality, preserve the vascular axis, preserve the membrane and so it is better to use it. You know chronic kidney disease is an inflammatory condition and you know the atherosclerosis is not a degenerative condition, it is an inflammatory condition, so you want to reduce it. Today, the reduction of the blood pressure is not just reducing the blood pressure, it is beyond reducing the blood pressure, it should be anti-inflammatory drugs. You can use it, only thing is, if you find that there is 30% rise in potassium in 2 weeks' time, to wait for 3 to 4 weeks, in the third to fourth week it settles down and comes down, then you continue to use ACE or ARB. Question: How to tackle a risk of hyperkalemia by using spironolactone in CKD patient. Dr. Amaresan: Those patients who are not responding to ACEI, beta-blocker, long-acting calcium channel blockers and such type as Dr. Kaul said, resistant cases, you can use aldosterone antagonist, so that there is a completion of renin angiotensin aldosterone system blockade, but then when you are doing the urea-creatinine once a month, you should also do sodium, potassium, bicarbonate and chloride and if you find that there is some persistent hyperkalemia, you may have to withdraw the drug, but then there is always an advantage of using aldosterone antagonist because they reduce proteinuria, they reduce the resistant hypertension, they reduce the apoptosis and myocardial fibrosis and renal cell death and so it is advantage, use 25 to 50 mg, monitor the potassium, then there won't be any issue. Dr. C. Venkata S. Ram: So, sensible degree of azotemia is a reason to continue the way beta-blockers are continued when they produce bradycardia that is exactly what it is. Question: Do you tackle systolic hypertension in significant aortic regurgitation as a separate entity? 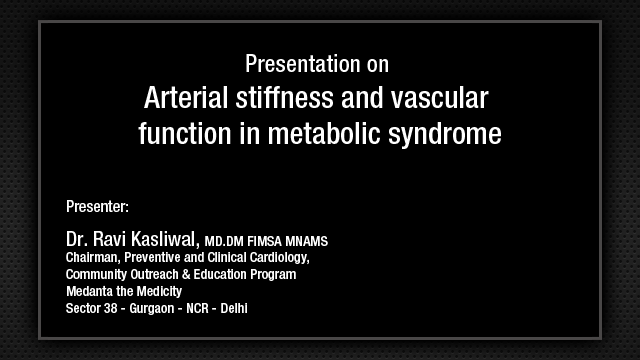 Dr. Upendra Kaul: Systolic pressure elevation and aortic regurgitation go hand in hand, we know that. Severe the aortic regurgitation, especially in young people with the preserved ventricle, and if it is really high, you know very high 160, 180 or something like that, I think I will treat it by giving a diuretic, not a beta-blocker, as you know the beta-blocker is going to increase aortic regurgitation by reducing the heart rate, but ACE inhibitors, which are good, at the same time they reduce the left ventricular stiffness and other things. So, to an extent yes, one will not alarmed because it is a part of aortic regurgitation, but if it is too high, I think it should be treated because systolic hypertension, stroke, and other things are related. Dr. C. Venkata S. Ram: Dr. Sinha, you agree? Dr Nakul Sinha: Largely yes, because systolic hypertension is bound to be there in any aortic regurgitation, but you can't be very aggressive on the treatment because it won't come down also no matter how many drugs you give. 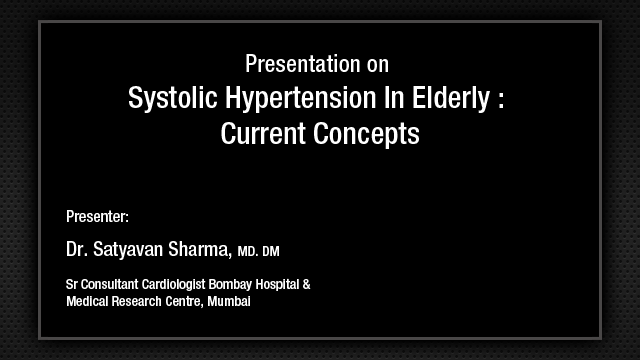 Dr. C. Venkata S. Ram: One thing about systolic hypertension is as Dr. Kaul has mentioned, fortunately, human body is really, really wonderful, when you treat isolated systolic hypertension, it is a systolic blood pressure that goes down more than diastolic blood pressure. That is very simple phenomenon of biophysics, higher the pressure greater is the drop, lower the pressure lesser is the drop, so that is what protects us. Question from Audience: In my post MI cases in a normotensive or mildly hypertensive patient what is advisable to start for beta-blockers and ACE inhibitor in up titrating dose or a down titrating dose? Dr. Upendra Kaul: The COMET study very clearly has given us lessons because the previous teaching used to be give beta-blockers in high doses because when we had nothing to treat myocardial infarction, beta-blocker was very important to bring down the ST segment. Now, that we have reperfusion therapies, it is very clearly shown if you produce hypotension in the first 24 to 48 hours, whether it is by beta-blockers or ACE inhibitors, you increase the chance of cardiogenic shock. So, one has to start beta-blocker, but in a very small dose, unless the patient has a myocardial infarction with elevated pressures, sinus tachycardia 160-170 plus heart rate of 80-90. There certainly we will go with a little higher dose, may be 12.5 to 25. Otherwise, on the first day of myocardial infarction with a pressure of say 100 or 110, I will not start beta-blockers and I will not start ACE inhibitors. Repeatedly studies have shown as IV Enalaprilat has shown that you give it fast and rapid, you know, you increase mortality because hypotension is to be scrupulously avoided in the first few hours up to 24 to 48 hours after MI. Dr. Siddharth Shah: When we are giving combination therapy, which drug should be given and which should be given in the morning and which should be given in the evening? 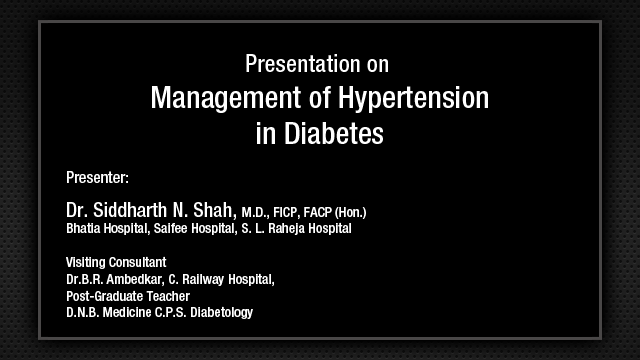 This we have added debate in the past also in the hypertension conferences. The consensus amongst every one was that we should give the drugs in the evening that is what is recommended, but if the patient is being given in the morning and if he is well controlled, do not try to switch over to evening. The rationale for giving the blood pressure drugs in the evening is to prevent the dips in the central aortic pressures in the evening and early morning. So, the recommendation is to give the blood pressure medicines in the morning, whether you give beta-blocker or calcium channel blockers, but as most of us who practice, we give drugs in the morning and if they are well controlled, I think most of the drugs will control the blood pressure due to the combination effect. Dr. C. Venkata S. Ram: In the western world the blood pressure goal reached only in about 35% irrespective of their economy, so only one-third of patients achieve the goal. That means they remain hypertensive no matter what you do. The one other question is, long-acting drugs, they gave an example of telmisartan, whether one can give it just once a day or I guess they mean is it okay even if we give it twice a day. My feeling is that by giving twice a day, you do not cause hypotension because the body reacts in such a way. So, if you have to give it twice a day, you give it, but there is no reason to give it twice a day, but twice a day is not harmful unless the patient is volume depleted. Dr. Amaresan: Actually compliance of the patient is to take once a day that is why these drugs act for about 24 to 48 hours. Once a day will suffice unless you want to increase the, you know, the blockage of the renin angiotensin system you can increase the dose. Dr. Siddharth Shah: Taking the cue on what Dr. Venkata Ram said, this is the latest in February 2013, even in U.S.A. despite significant improvement during the past decade, achieving the ABC, that is, hemoglobin A1c and cholesterol and blood pressure goals, goal remain suboptimal among adults with diabetes. Only 52% have A1c goals achieved that is 7%, 51% have BP goal at goal and 56% have an LDL of less than 100, so this is what in spite of having so much knowledge, if we can apply this knowledge in our practice, and only 18% have achieved a goal of less than 100 in LDL. So, this tells us that we have to be more proactive in our goal to achieve these goals of controlling the blood pressure, the diabetes and the LDL in our patients. Dr. C. Venkata S. Ram: The role of anti-platelet drugs in hypertension. We know the role of statins, we know the role of glycated hemoglobin, but actually it has not been studied as such, but I think the indications for aspirin in general should be followed. Based upon the gender, based upon the age, risk factors, etc., but hypertension per se an anti-platelet therapy, I know it has not been looked into. Dr. Amaresan: Not hypertension per se, but then in addition giving the antihypertensives, you give aspirin, I think there is reduction in the morbidity. I am not saying that you give aspirin for reducing the blood pressure, but then in addition to the antihypertensive therapy there are 2 or 3 control trial where you give aspirin if there is no contraindication, you will find that the morbidity and mortality is much less. Dr. Upendra Kaul: I think there has been re-thinking for the aspirin. If we are talking of primary prophylaxis, if there is hypertension with ischemic heart disease, no doubt. For primary prophylaxis, I do not think hypertension as of today should be treated with an additional anti-platelet agent. HOT trial did something, but in general it has been seen the patient population where aspirin does some benefit also increases the bleed, so you might have to treat 100,000 patients to prevent 1 stroke and 1 bleed. So, at present pure hypertension unless it is associated with other risk factors like diabetes or previous ischemic heart disease does not call for treatment with aspirin or clopidogrel. Dr. C. Venkata S. Ram: As Dr. Murlidhar Rao mentioned, in the Hypertension Optimal Treatment trial, the benefit of aspirin was significantly there in a diabetic core. So that was indication for aspirin therapy. Dr. Upendra Kaul: Even in pure diabetics, now it is 2A. Only those diabetics more than 55 years of age in men with one more risk factor that is 2A and it is not 1. Question from Audience: You made a mention about renal denervation therapy; I was wondering whether we have to study the renal artery physiological contraction before you actually activate this denervation. 1. The renal artery should not have significant renal artery stenosis. 2. Each kidney should be perfused by only 1 renal artery; otherwise you have to multiple arteries. 3. The patient should be really with resistant hypertension , no other things, and chronic kidney disease, which could be one of the very important indications at present is not being addressed to because it is pure cases of resistant hypertension without renal artery stenosis and with single renal artery. Dr. C. Venkata S. Ram: One other thing that will come out from the study that is going to be done in India is because the indication is resistant hypertension, they will have a by product to see how many patients actually have renal artery stenosis during the indications for renal disease, it will be very interesting to see. Question from Audience: Regarding use of aspirin in hypertension in diabetic, should we give to every diabetic aspirin? Dr. Upendra Kaul: We are talking again, diabetics without ischemic heart disease. Diabetic and hypertension, if the person is more than 55 years of age, yes, 2A indication, that means it is more data to suggest it is helpful and less data to suggest it is harmful. There is still some data, which is suggesting it may not help, it may increase bleeds. Dr. Muralidhar Rao: In ADA guidelines, the aspirin indication is not in simple diabetes, but diabetes with high risk; family history of ischemic heart disease, past ischemic heart disease, somethings like that. If they are there, then high-risk diabetics will have aspirin, that will be beneficial, not in the only diabetes patient population, that is an ADA guidelines. Question from Audience: With barrier of age, after 55 years. Dr. Upendra Kaul: More than 55 years of age in men because below that there are lower risk if they do not have any other risk factor. Dr. Nakul Sinha: Actually, this renal denervation therapy is a very interesting concept and what else is being seen that this is also being tried in congestive heart failure, chronic kidney disease and metabolic syndrome and it has been shown to be having good results in obstructive sleep apnea. So, this is something which is targeting the whole sympathetic nervous system and seeing the effects, which are mediated and which lead to these multiple problems. So, this is the first step for tackling refractory hypertension, resistant hypertension, but then I am sure there are going to be many more indications later on. Dr. C. Venkata S. Ram: We will summarize and then maybe Mr. Joshi can come here for the concluding remarks. Ladies and gentleman, you may not know it, but you actually have covered lot of topics yesterday and today. It does not feel like this because you are in Goa, you don’t feel you have covered anything scientific, but let me tell you, we covered systolic hypertension, blood pressure measurement, arterial elasticity, therapeutic goals, role of combination, Indian Guidelines, diabetic patients, CKD, beta blockers, calcium blockers, refractory hypertension and a plethora during the discussion. So, we really covered substantial then what the scope offered, so I am really grateful to the speakers, most importantly to the audience and to the organizers of this symposium for this opportunity. Copyright 2012 Eris. All Rights Reserved.